The Mark Todd range of equestrian gear and accessories has always been a mark of quality and practicality, and the Mark Todd Lightweight Turnout Rugs are no exception. They?ve been developed and designed in full with the help of Olympian Mark Todd ? a man known the world over for being an expert on horse riding and all things equestrian. It?s no surprise then that the Mark Todd Lightweight Turnout Rugs are some of the bestselling horse wear products in the entire industry. Let?s find out a little more about them. What are the main features of Mark Todd Lightweight Turnout Rugs? 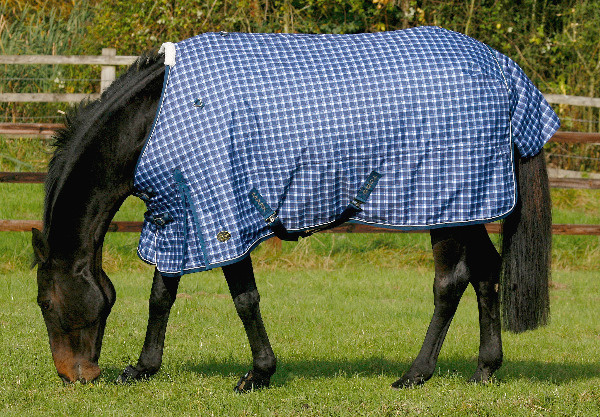 The lightweight horse rug is generally used during the Spring and Autumn months as a way to keep the horse protected from the varied elements without getting too hot. The Mark Todd Lightweight Turnout Rugs have been designed for a wide spectrum of horse shapes, and because of their unique design they are recommended for horses ranging from very slender to quite broad. These Mark Todd Lightweight Turnout Rugs are coated with Teflon which makes them totally waterproof, as well as being breathable thanks to the 600 denier riptstop polyester outing. Each has a cotton lining as well as a double buckle at the front. All of these Mark Todd Lightweight Turnout Rugs are totally adjustable for fit, and include nylon shoulder gussets to protect against friction damage in the shoulder area. There are lots of reasons to choose a Mark Todd Lightweight Turnout Rug over the many other types of rugs that are available. For one thing, the design and technology that?s gone into each and every rug means that your horse won?t only be comfortable, they?ll also be protected against the weather, insects and more. The lightweight nature of the Mark Todd Lightweight Turnout Rugs means that they?re ideal for warm weather or for rain protection ? and as well all know, the weather in the UK is not always on our side during the summer, so these rugs can be the very best choice for that time of year. On top of all this, there?s also the fact that Mark Todd Lightweight Turnout Rugs are available in a couple of different designs, from plain to plaid ? so you?ve got a choice as to how your horse looks when out on the field. The Mark Todd Lightweight Turnout Rugs are a superb choice for beginners and professionals alike. If you want to feel sure you?re taking care of your horse to the best of your ability, one of these rugs is an excellent addition to your stable. Your horse will be comfortable, protected, and will look great too. The Mark Todd range is packed with other handy products for horses and riders alike, so be sure to take a look at the full roster of products when you?re looking at these Mark Todd Lightweight Turnout Rugs.